I've got 400+ notes in Apple Mail.app. What's the easiest way to import these into Evernote? I tried the Import... feature, but this wouldn't let me select my notes mailbox, even after I tried to Archive the Notes mailbox. If you can get Mail.app to export your notes as separate files (either RTF or plain text), you can then import these into Evernote by dragging them on to our dock icon. I tried selecting several notes and either copying or Save As from Mail.app, and it seemed to always want to create a single block of text in a file rather than multiple files. Yes, that's exactly the problem. How do I get Apple Mail to export Notes into multiple files, preferably without all the email headers. Anybody have a script, or something to tear apart mbox files? This is very easy in Ruby using appscript. The main point is, the notes have to be dragged into a new mailbox. For whatever reason, the Notes "folder" doesn't exist where Mail's scripting is concerned. In this example, I made a new mailbox called "NoteMigrate" so it appeared under "On My Mac." The script will create a notebook called "ImportedMessages" if you don't have one already, and it will tag each note with "imported_note." The first line of a given note is the 'subject.' All the lines of a note, including the first, are the content. I don't do much scripting with Applescript directly because I got more fluent with Ruby using rb-appscript much more quickly. The logic is so straightforward I'm sure an adept Applescripter will be able to translate it. If nobody shows how in a day or two, I'll do it. Well, it was pretty easy in AppleScript, too, since I had some scrap code from a while back. Same deal as before: Drag all the notes into a new mailbox called "NoteMigrate." set theMessages to every message of the mailbox "NoteMigrate"
create note with text myText title myTitle notebook "Imported Notes" tags "imported_note"
Wow, that's great. You rock! And with two different options, no less! Works great, but Is the created or last modified date available to add to this import code? That's pretty important sometimes, and the fact that Mail.app notes doesn't seem to track date created is one of the problems that motivated my search for Evernote. You just need to grab the "date sent" attribute when you look at the original note, then add it as the "created" property to the newly created Evernote item. Ok, now I admit it too; you rock! Simply incredible. I've been trying to get my 250 notes from my old blackberry to my new imac and iphone for two months. Thanks so much. Apple Script version: This worked great, but as a first time user of apple script, I had to figure out a few things. 1. Open up the application "Apple Script Editor." 2. Paste in the text from the post above. 3. Open Mail application. Control-click on "inbox" and make a "New Mailbox..." and name it "NoteMigrate." 4. Select all your notes and move them into the new folder "NoteMigrate." 7. Click the icon "Run." 9. Go back to Evernote, and see the result. The capture of creation was a nice improvement, but many users also like to sort the notes based on date updated, from most recent to least recent, right? The output from your script currently creates a rather awkward situation, since it actually reverses this order due to the fact that the "updated" date defined in Evernote for the newly imported notes is set by the order in which they are imported, and it seems that the script by default imports them starting from the most recently updated to least recent, as defined in the Mac's Note database. Once they land in evernote, they all have the correct original creation dates (lovely! ), but they all have today's import date and time for their "updated" values (so they all differ by about 1 seoncd or so, as the script was walking through the list). Tried a quick "dumb fix" of reversing the sort order in Mac Mail prior to import but this doesn't help, since it is just a viewing option: the script apparently follows the order set by the last modified date of these notes. -the smart fix: figure out how to capture the "last updated" values from the Mac database, and use them to reset the corresponding "updated" values in Evernote after the import is complete. -the acceptable work-around: if resetting the "updated" values correctly is not possible, then you could maybe get the script to at least least reestablish the correct "updated" order by altering this order either before or after the import, by getting either Mac Mail or Evernote to go into each of the notes in the reverse order and adding a benign edit (e.g. an extra space or punctuation character at the very end of the note text field). This would result in the correct "udpated-based sorting", at the modest price of losing the actual last update dates from before the import process. An internal database error has occurred that prevents Evernote from functioning properly. If the problem persists, please contact Evernote Support. What's happening is that Evernote balks at titles that are too long. I'm trying to figure out how to fix this. Here's a fix I kludged up. I'd much rather have it pick, say, the first four words, but when I tried that it came out allruntogether, and I didn't see an easy way to remedy that. set theOMessages to every message of the mailbox "NotesExport"
Modified this script to work with Mavericks Notes, which is no longer in the mail app. Bloody brilliant mate (and to all who've contributed) works like a charm. I currently have over 500 notes on my Apple desktop computer in the app notes. I want to move them into Evernote, as separate notes. 1. I can not get the Notes into my Mailbox, unless I do each one manually. I think it may be the Maverick iOS edition as there is no option for showing notes in Mail. Please could someone advise me on how I can get these Apple Notes on to Mail, then Mail to Evernote. Thank you very much d.b.Walker and ScottLougheed that just saved me a whole day! Did not realise AppleScript worked like that.. AMAZING! Found that not all of my 1500+ notes from Apple's Notes.app had delineated titles. Since the "title" of a note is generally the first line, I was getting errors from Evernote when it was trying to create notes with a title larger than 255 characters. I suppose you could truncate the title to only take the first 255 characters of the title, but I found that setting title to the creation date as a string was more clean. Hope this helps anyone running into the same problem! Thanks d.b.walker! It worked perfectly! I actually need to truncate the first 255 chars of the title. The script that set the first 20 didn't work...What would the code for that be? I'm using the script but it's giving me an ["... Connection is invalid." number -609] error. I end up with about 2/3rds of my 250 Notes imported. I can't see any pattern of which Notes are imported and which aren't. Many thanks from a less than "Programming for Dummies" - level guy who had an intro course to C++ 15 years ago and never coded anything from then on. I was still able to follow procedure! Wow. Very proud of myself. Whoohoo ... works great on my macs with Yosemite too!! Hi! I am also interested in merging my Apple Notes to Evernote. Could someone explain exactly how to run this script in a step-by-step process for people who know nothing about coding, etc? I assume you cut and paste this, but to where? Then you run, and then what? You just open Evernote and everything is there? Could someone outline the exact process? I'm on Yosemite. I don't have any Notes name more than 255 characters. Thanks! i can see this script importing my 550 notes to evernote... i trusted the .zip file listed on the link of the last post before me and its just beautifull!!! ( i didnt know where to start with the script)... i agree that the dates are an issue but i finally have acces to my notes so i dont care about the date!!! thanks to all of you!!! you really made my switch from ios to android finally possible! I am running Yosemite (Mac OS X 10.10.1 and consequently Apple Notes 3.1 and with the script below I receive the error: "Syntax Error Notes got an error: AppleEvent handler failed." at line two with "every note" highlighted. You might try a Google on "applescript select all notes" since the issue seems to be in how you are trying to select all Notes. I cannot seem to find any apple script command for 'select all' in notes. But is that even possible? Surely there must be such a command. I can certainly select all notes manually in the notes app, so why would this scripting feature be absent? Thanks ever so much for your help. I now see you were talking about the Notes app. A similar approach should work there too. Sorry I'm such an applescript novice I've no idea how to include your suggestion. I've typed the following script out (and also tried to tweak it), but it gives me the following error: Expected end of line, etc. but found end of script. @Adjusting: I can see that you are an accomplished AppleScript coder. Could you please help us get the AppleScript issues with EN Mac 6.0.5 fixed? Many of use routinely rely on AppleScript in our Evernote workflows. I’m good at debugging and modifying other people’s scripts, but I don’t know if I could write one from scratch. Which other issues are affecting your workflows? @Adjusting: Is this the bug that has been fixed in Ver 6.0.6 B2? Thank you Adjusting, but I don't see how your script differs from the one I initially tried (see my post dated 18 Jan 10:30AM). Apologies if it is different. No, you’re right. There doesn’t seem to be any difference. I was just trying to fix the problems with your latest script (using keyboard shortcuts that don’t exist, using theMessages before setting it, mismatched tell and end...) and didn’t reread the whole thread. What were you trying to accomplish with your latest script that your original didn’t do? What I'm trying to do is the titler of this discussion. "Importing from Apple Mail.app's Notes"
Except that - as you probably realise - Yosemite has its own stand alone Notes App, meaning notes in Yosemite are no longer stored in the Apple Mail App. Right, but your original script already did that. I’m just trying to figure out what the goal of your changes was. The original script does not work, that's why we're having this discussion. Excellent! Worked perfectly. Thanks for posting this, Calion. This script will import all your Notes and create folders for each Account. For instance, if you have iCloud and a Gmail account, it will create "Imported iCloud" and "Imported Gmail" folders to store respective notes. It also sets mod date to the correct field. Thanks everyone for creating the base for this. Nice work everyone - many thanks. Has anyone figured how to include embedded images from your notes in Notes.app to the new Evernote note? Oh, My, Goodness! I can't believe that I just figured out how to do this! Thank you SOOOO much for putting the notes here. I have spent at least 1.5 hours trying to figure out something that "should" be simple - just download about 30 notes from my MacBook Notes to Evernote. 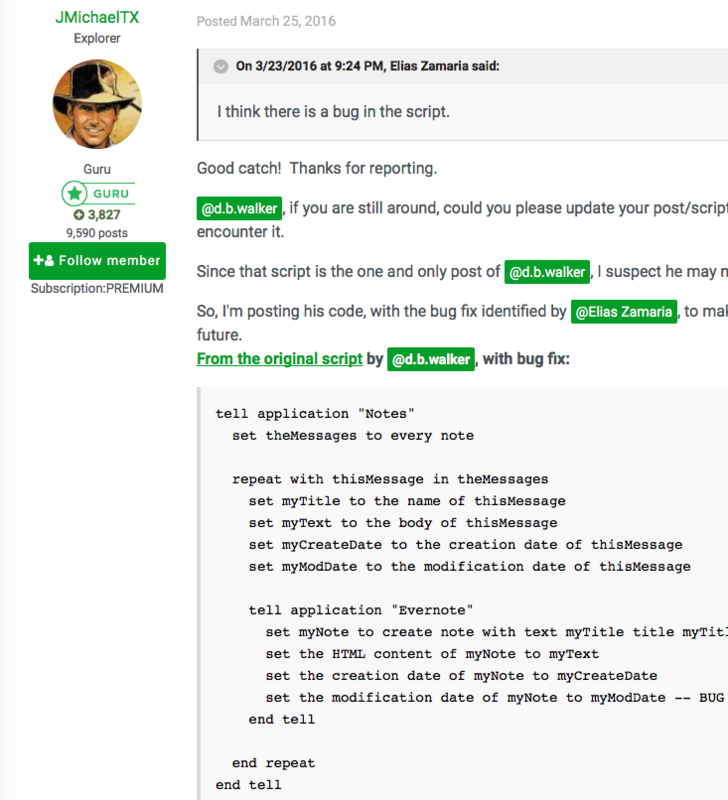 I "ran the script" that you suggested, and I am not sure what it really did, but now I see all these notes in Evernote. Now, if my computer starts smoking, and little bugs start running out, I will know that it didn't work as well as I think, but thanks so much! I feel so proud of myself, because I think I just "programmed" my computer, or something like that!! How do I do this in Mavericks? Run in Apple Script Editor? Does Evernote need to be open? Dude. That totally worked. Thx so much! Thanks for the work of all. Any news of that issue? I can not figure out how to export the body (text) + attachments (images) of Notes.app to Evernote. This thread is awesome and d.b.walker your script is amazing and worked like a charm- it did in seconds something which would have taken me hours to do manually. I think there is a bug in the script. Good catch! Thanks for reporting. @d.b.walker, if you are still around, could you please update your post/script to fix this bug so others do not encounter it. Since that script is the one and only post of @d.b.walker, I suspect he may not be active in the forum. So, I'm posting his code, with the bug fix identified by @Elias Zamaria, to make it easy for others to find in the future. NOTE: I have not tested this code, so I can NOT vouch for it. Use at your own risk. I've made a minor adjustment to this code, it preserves folders and account by making a new notebook for each folder (within an account) and tags the account the note is associated with. This can be easily switched if you prefer your notebooks to be based on accounts and tagged with the folders. if you want to make the notebook names from accounts and the tags from folders (opposite of what I have), you would change "set myNote to create note with text myTitle title myTitle notebook myFolder tags myAccount" to "set myNote to create note with text myTitle title myTitle notebook myAccount tags myFolder". Thank you Matthew. For some reason, none of the HTML or attachments in my Notes get exported to Evernote with your script or the original script, just the plain text, title, and dates. A lot of my notes have HTML links to the original web pages I created them from. How can i migrate that? can you make all of the attached pictures and pdf inside the notes to transfer to? Has anyone had luck with this script in High Sierra? I was able to run this before on an older version of Mac OS, but now I am seeing errors: "Evernote got an error: The operation couldn't be completed. (Evernote XML Error error 4.)" I posted my question here, but haven't gotten help there either. Has anyone had luck with this script in High Sierra?﻿ I was able to run this before on an older version of Mac OS, but now I am seeing errors: "Evernote got an error: The operation couldn't be completed. (Evernote XML Error error 4.)" I ran this script without any errors. However, this only copies the text. It does not copy any attachments. The above code works brilliantly to transfer all my notes (thanks a lot!!). However, I can't manage to transfer the titles. Anything more than 70-80 characters gets truncated. Hence, the first paragraph from IoS notes is being lost. First paragraph In IOS - "Volatility spread, maturity price matrix. They are using pd matrix for maximum 3-4 dimensions. For anything bigger than that Monte-Carlo simulation is used. " Title in Evernote - "Volatility spread, maturity price matrix. They are using pd matrix…"
The second part of the above sentence does not appear anywhere in Evernote. is it possible to transfer the ios note title into the body of the evernote note and rename the note by the date created? It's the end of 2018 and this code still works to transfer Notes into Evernote. It ends with an error but a hand-audit revealed all notes made it into Evernote. This solution should be elevated within Evernote Support documents. Took a *ton* of time searching Google before tripping across this. If you need to export Apple Notes into Evernote... this is by far the fastest & easiest way to do it.